What do sensational celebs like Ariana Grande, Will Smith, Chris Pratt, Noah Centineo, Lana Condor, JoJo Siwa and Migos all have in common?! They are some of the many incredible stars who will be getting their slime on at the most anticipated award show of the year… the Nickelodeon Kids’ Choice Awards! Each year, Nickelodeon manages to make the KCAs even bigger and better than years before and this year’s award show sure does have a lot of excitement in store – from an epic performance to a star-studded list of celebs who will be attending. Of course, an award show this spectacular calls for a brilliant host and that’s where the one and only DJ Khaled steps in. Anotha Nickelodeon KCA is coming up and with DJ Khaled as host, we know it’s going to be MAJOR KEY! There’s nothing quite like the Kids’ Choice Awards as it is the one award show that brings so much joy to viewers and it brings people of all ages together to enjoy an unforgettable night filled with lots of fun. Many exceptional celebs are ready to have a blast at the KCAs… and the Kids’ Choice Awards isn’t complete without a bunch of stars getting doused in a whole lot of slime. In addition to those named above, Adam Sandler, Joey King, Liza Koshy, Paris Berelc, Caleb McLaughlin, Kiernan Shipka, Ally Brooke, Josh Peck, Lilly Singh and David Dobrik are some more celebs who will be having a marvelous time at the magnificent award show. The casts of Nickelodeon shows including Henry Danger, Cousins for Life, Knight Squad and more will also be attending the KCAs. The KCA party continues as Migos will be taking the stage at the award show and they are set to perform a medley of their greatest hits. From “Walk It Talk It” to “Stir Fry” and more, we can’t wait to see Migos’ outstanding performance at the Kids’ Choice Awards. Fans have been able to vote in a countless amount of categories to help their faves win big at the Kids’ Choice Awards. Categories include “Favorite Movie,” “Favorite TV Host,” “Favorite Song,” “Favorite Social Media Star,” and “Favorite Video Game,” amongst many others. Fans have been busy voting on the Nickelodeon KCA website as well as on social media platforms including Twitter and Instagram and on Saturday, March 23rd, it’s time to see who will win their own coveted blimp at the event. With the Nickelodeon Kids’ Choice Awards only a few days away, I, Alexisjoyvipaccess am giving you all your first look at where all of your fave celebs will be sitting at the award show. 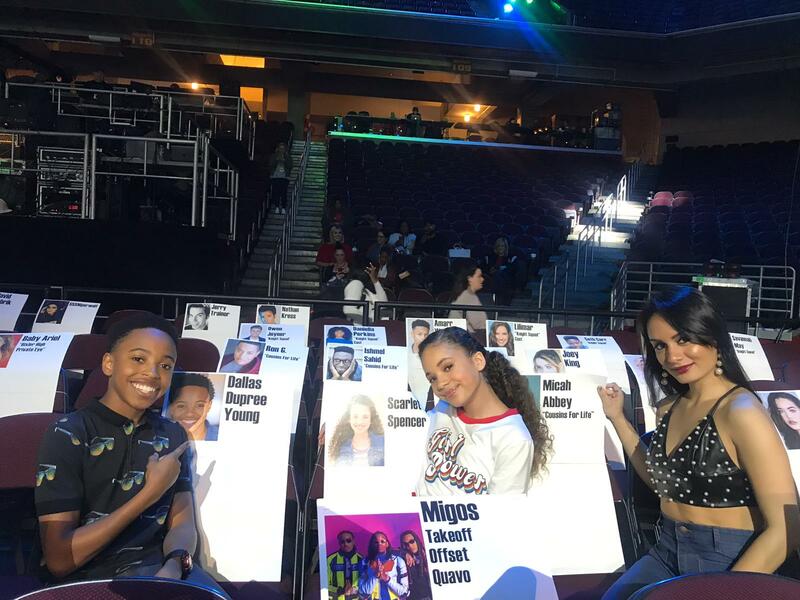 Find out where Noah Centineo, Lana Condor, JoJo Siwa, Migos and more will be sitting at the KCAs in my seating card tour with Cousins for Life stars Dallas Dupree Young and Scarlet Spencer. Take a look at my VIPAccessEXCLUSIVE seating card tour of the 2019 Nickelodeon Kids’ Choice Awards with Dallas Dupree Young and Scarlet Spencer below and be sure to tune in to the KCAs airing live from the USC Galen Center in Los Angeles, California on Saturday, March 23rd at 8:00 PM ET / PT! Previous Article: Ariana Grande, Will Smith, Adam Sandler, Noah Centineo, Lana Condor, Isabela Moner And More Will Appear At The 2019 Nickelodeon Kids’ Choice Awards PLUS Migos Set To Perform! Next VIPAccessEXCLUSIVE: Max And Harvey Interview With Alexisjoyvipaccess At The 2019 Nickelodeon Kids’ Choice Awards!